Tramper - This is likely the hottest selling Minnetonka boot - it's a classic. Hi Top Back Zip - Another popular women's style - very earthy, very comfortable and stylin'. The "Layers"! 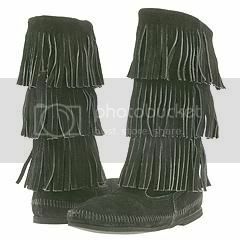 - There are 3 layered (shown left) and 5 layered fringe women's Minnetonka boots - pretty nifty, very stylish. Woodstock - another very hot seller. This boot has a sort of a "hip" look to it, having fringe and beads - coming up to about mid-calf. Front Lace - Long, tall boot graced with fringe hanging down from the top of the boot shaft. Our favorite: It's hard to pick, so we will give a couple. Both the 3 layer and the Woodstock are real favorites of ours.